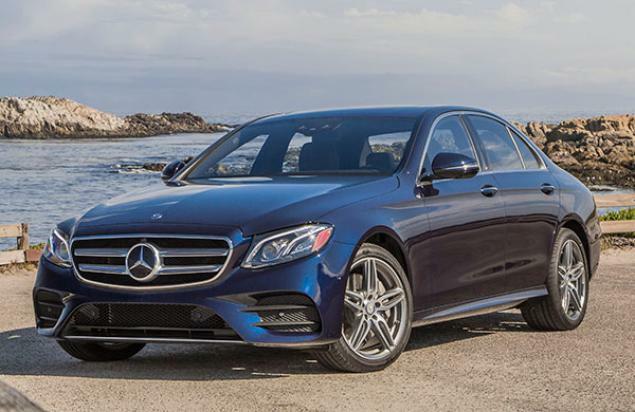 The 2017 Mercedes-Benz E300 sedan is all new. It’s bigger, better looking, more efficient and more substantial than before. It’s more technologically advanced than the flagship S-Class, with more infotainment and safety equipment. The E300 can practically drive itself. Competitors like the Audi A6, BMW 5 Series, Lexus GS, Jaguar XF, and Cadillac CTS can’t do that, although the American Tesla Model S can. The 2017 E300 sedan is the first of the all-new E-Class. It will be followed by an all-new 2017 E-Class Wagon. The E-Class coupe and convertible continue in the form of the previous generation. We have seat time in the new E300 in heavy traffic outside Lisbon, Portugal, and freeway traffic outside San Francisco. The new Mercedes-Benz E-Class sedan grows by 1.7 inches to 193.8 inches long, with a wheelbase that’s 2.6 inches longer, at 115.7 inches. It weighs about two tons, and would weigh more if it weren’t for the body’s aluminum panels and higher-strength steel. For now, the new E-Class sedan has just one engine and transmission, the E300 with a 2.0-liter turbocharged four-cylinder making 241 horsepower and 273 pound-feet of torque, mated to a 9-speed automatic. Rear-wheel drive is standard, 4MATIC all-wheel drive available. The 2017 E300 is fairly quick, able to accelerate from zero to sixty in 6.2 seconds (on the way to 130 mph), but it’s also gruff. The outgoing silky V6 engine the four-cylinder turbo replaces will be missed. Two suspensions are available for the E300, and the handling varies with them. There is a firm multi-link suspension with adaptive dampers in either base or sport (firmer) tune, or an air suspension with adaptive dampers. In addition to that, the wheel sizes range from 17 to 20 inches, mounted with different tires. It’s not your father’s E300. Driving systems with modes are also available: economy, comfort, sport and sport plus, that alter the suspension, steering, transmission, and throttle. The 2017 E300 hasn’t been crash-tested by the government or insurance industry yet. However, crash ratings nowadays take into consideration not just crashworthiness, but crash-prevention features. Which is subjective. For example, the new E-Class will change lanes on its own, after the turn signal is on for two seconds. This is a good thing? Why? Can anyone besides us see the problems with that? Starting with maybe you want to give the person behind you more than two seconds’ notice. The government and insurance industry might say it’s safer than the driver making the decision to change lanes when he or she sees that it’s safe. Other safety equipment includes the car telling you when it thinks it’s time for you to take a coffee break; a shriek when it thinks you’re going to crash, followed by automatic braking; maintaining an exact distance to the car in front of you at 130 mph like a NASCAR driver, meaning the guy in front of you has his feet on your pedals. When he floors it at 10 mph, your car does; when he slams on the brakes, your car does. Another issue is inconsistency; the auto-driving turns itself off after about 20 seconds, maybe in the middle of your thinking it’s driving for you. And the cameras that see the white lines at the edge of the road can’t see a white line that’s faded. So you might think it will keep you from running off the road, but it only keeps you from running over visible white lines. It only knows a road is a road by the paint. Meanwhile, there are potential virtues. A new system hits the brakes if you don’t see oncoming cross-traffic, preventing you from being T-boned or T-boning another. It will park or unpark itself using a smartphone app. And there’s a trigger that will inflate a seat bolster that shoves the passenger three inches farther away from impact.